 The Boostnote team uses IssueHunt for a sustainable open-source ecosystem. Apps available for Mac, Windows and Linux. Built with Electron, React + Redux, Webpack, and CSSModules. Thank you to all the people who have contributed to Boostnote! 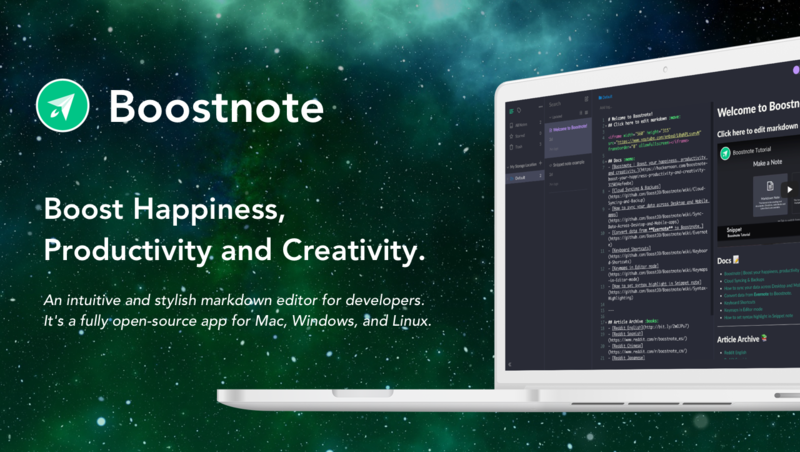 Boostnote is an open source project. It&apos;s an independent project with its ongoing development made possible thanks to the support by our amazing backers. Development: Development configurations for Boostnote. Copyright (C) 2016 - 2019 BoostIO, Inc.